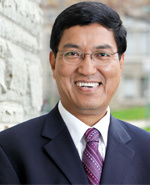 Amit Chakma is the 10th President & Vice-Chancellor of Western University. President Chakma arrived at Western in July 2009 after serving the University of Waterloo since 2001 as Vice-President, Academic & Provost, and as a professor in the Department of Chemical Engineering. Prior to that, he served as Dean of Engineering and then Vice-President (Research) and International Liaison Officer at the University of Regina. He began his academic career as a professor of chemical and petroleum engineering at the University of Calgary. On November 22, 2012, Western's Board of Governors re-appointed Amit to a second term as President extending to June 30, 2019. Amit is a graduate of the Algerian Petroleum Institute (Dip. Ing., 1982) and the University of British Columbia (Master of Applied Science, 1984 and PhD, chemical engineering, 1987). The author of more than 100 articles, he is an expert in areas related to petroleum research and energy management. His research interests include mass transfer, gas separation, gas processing, membrane separation, petroleum waste management, greenhouse gas control technology, and energy and environmental systems modeling. In addition to his roles at Western, President Chakma serves as Chair of the Council of the Association of Commonwealth Universities as well as a member of the Science, Technology & Innovation Council of Canada. He is the Past Chair of the World University Service of Canada and was the inaugural Chair of the U15 Group of Canadian Research Universities. He also served in 2012 as Chair of the Federal government's Advisory Panel on Canada's International Education Strategy which helped to inform the development and launch of Canada's new international education strategy unveiled in January 2014 titled Harnessing our knowledge advantage to drive innovation and prosperity. In 1998, Amit was recognized with Canada‘s Top 40 Under 40 Award, given annually to honour Canada's best and brightest in their fields younger than 40. He is also a fellow of the Canadian Academy of Engineering, and he received the Queen's Diamond Jubilee Medal in 2012 in recognition of his contributions to Canadian postsecondary education. In 2014 he was named among RBC's Top 25 Canadian Immigrant Award winners and became the first Canadian university president to receive the Michael P. Malone International Leadership Award, sponsored by the Association of Public and Land-grant Universities. In 2015, Amit was recognized by the University of British Columbia's Faculty of Applied of Applied Science for his Lifetime Achievement in Engineering.